If you like this free game, try Ancient Rome. Construct entire residential districts for people and improve their well-being by building markets, schools, theaters and other places, and connect them with roads for ease of access. Create warehouses and farms, plant wheat and bake bread, mine clay and manufacture all kinds of crockery. Once you have your manufacturing in place and running, provide your population with food, improving the status of households. Sell the excess of products and make more money. The richer households become with time, the more taxes they pay, thus helping you improve the city. Once you have successfully completed all the missions, you will be able to build your own villa! Download free full version game today and become a Caesar! 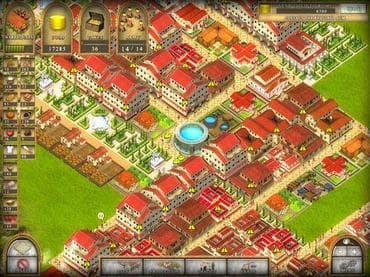 - 30 levels of pure fun; - Large maps for construction of your cities; - Build your own beautiful villa. If you have questions about Ancient Rome 2 game, please contact us using this form.